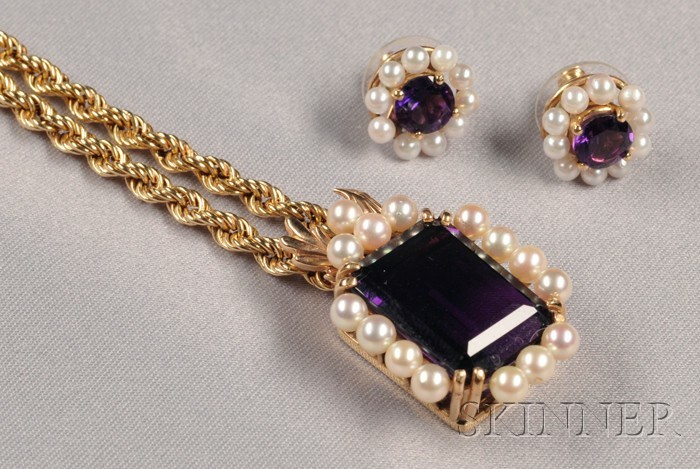 14kt Gold, Amethyst, and Cultured Pearl Suite, comprising a pendant set with a fancy-cut amethyst measuring approx. 20.00 x 14.50 x 8.90 mm, framed by cultured pearls, and suspended from a ropetwist chain, together with a pair of circular-cut amethyst earstuds with removable pearl jackets, lg. 1 3/8, dia. 1/2 in.